Blanch spinach in hot water. Remove and refresh in cold water. Heat oil in a kadhai, add chopped onions and sauté. Add crushed garlic, salt and pepper. Puree together with boiled spinach. Make a thin white sauce by melting butter in a kadhai. Then add maida and cook for 5-7 mins. Slowly add the milk so that no lumps are formed. Add the spinach puree to this and bring it to a boil. Add a little water if required. 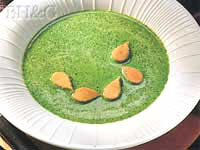 Correct seasonings and serve spinach soup hot.